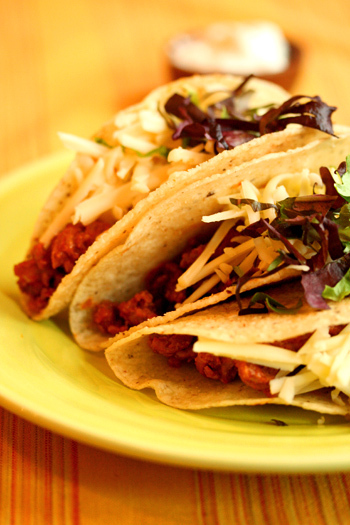 Make your taco meat ground turkey and add grated carrot and tomato for extra flavor and nutrition. Buy grated part-skim mozzarella in bulk – it is the most versatile cheese and you can use in almost any recipe and is several grams lower in fat than cheddar. Great way to use up left over cherry tomatoes, lettuce, and extra salsa that lingers at the bottom of the jar. Coat a large skillet with cooking spray and heat over medium-high heat. Add the olive oil. Add the turkey, carrot, and celery, and garlic. Cook 10-15 minutes, stirring occasionally until meat begins to brown and the vegetables soften. Sprinkle with taco seasoning and add tomato paste. Continue to cook an additional 1-2 minutes until the spices become fragrant. Add 3/4 cup of water. Reduce to a simmer and cook 5-10 minutes until turkey is no longer pink in the center and a thick sauce forms. Meanwhile, place corn tortillas in oven or toaster oven heated to 350F for 15-20 minutes or until warm. Assemble tacos by spooning in 2 tablespoons meat, cheese, lettuce, and salsa. Serve with sour cream and salsa tableside. Nutritional Stats Per Serving (3 tacos): 440 calories. 38 g protein, 28 g carbohydrates, 17 g fat (5 g saturated), 70 mg cholesterol, 2 g fiber, 784 mg sodium. I’m thinking of doing this recipe, but I don’t have available turkey meat in my fridge currently so, would ground (all most lean) beef do? I just got done eating this recipe and it was very tasty! I was unsure about the turkey because Im not really a turkey fan but it turned out great. Thanks! I’m new to this site. Why don’t you have nutritional information included with the recipes? We’ll be offering the nutritional info soon, please check back! Does using beef stock in the cooking of the turkey signicantly effect the fat content? You can use beef stock! Just opt for the reduced-sodium, light beef stock. Most brands will only a minimal amount of fat, say 1 gram to the entire recipe.